Since the year 2000, 90% of naturally occurring affordable housing units (NOAHs) in Alexandria have disappeared from the market, as housing costs continue to outpace incomes and our population grows faster than new development. While much of the cause of affordable housing includes preserving access to historically affordable properties, preservation alone is not enough. At the same time, the cost of new stand-alone developments can be prohibitively high and is growing higher, as construction, land, and other costs are factored in. Public-private partnerships (often called P3s) and other partnership arrangements have emerged as a way to counter this trend, and have included in recent years creative collaborations with public agencies, multiple partnerships with houses of worship, and re-purposing existing buildings for housing (and other services, like schools and shelters). 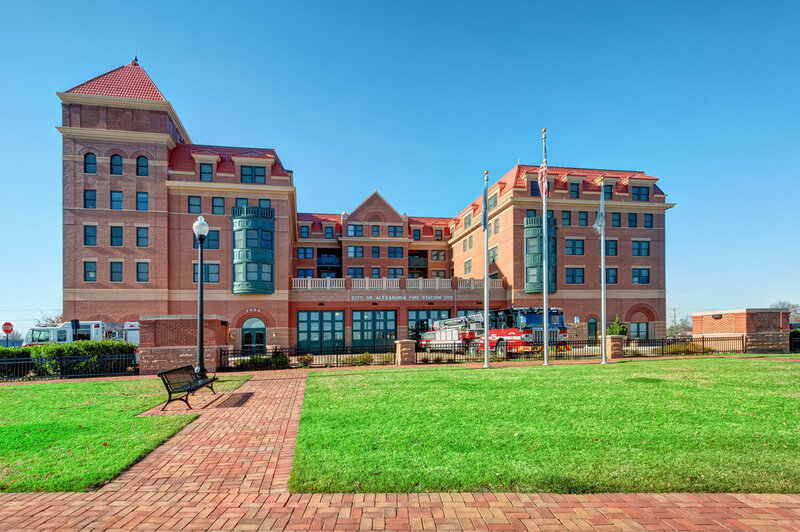 Kicking off this trend in the City of Alexandria in 2009 was AHDC’s The Station at Potomac Yard, a first-in-the-nation collaboration between residential housing developers and a fire department, which created new housing and maximized land use in the growing Potomac Yard neighborhood. Potomac Yard had been a historical center for trade since prehistoric times, according to Francine Bromberg of Alexandria Archaeology. After it’s early Native and colonial inhabitants, Potomac Yard’s first railway was completed in 1857 to connect Alexandria to Washington. The rail yard grew and added lines, employing over 1,500 persons at its peak (White and African American laborers, though in segregated facilities, and including women), and populated the town of Potomac, VA (now the Del Ray neighborhood). After over a century of growth, however, the rail industry’s wane took its toll, and Potomac Yard rail operations ceased in 1987. Following this, multiple mixed-use neighborhood proposals for the site emerged, including proposals for the Patent and Trade Office and Jack Kent Cooke stadium (now FedEx Field), none of which took off. Then, in 1992, a Potomac Yard Small Area Plan was approved, which made the area subject to the Potomac Yard Urban Design Guidelines and set the guiding vision for residential and commercial development in the area. An image from a City Planning Commission work session from June 6th, 2006, showing what the new town center might look like. The Potomac Yard planning commission began the early work envisioning the “new town center” in 2005. This would build a new neighborhood that would incorporate housing, retail, office, and open space integrated together to create an unified town character. In 2006, however, the issue of emergency services delivery was raised – with the layout and design of streets proposed for Potomac Yard, the City’s ability to deliver emergency services to this new neighborhood would be impeded. The solution, according to the Arlandrian: “[Potomac Yard Developers] would provide a parcel of land adjacent to the first neighborhood, as well as $6.6 million, to construct Alexandria's first new fire station facility in more than 30 years”. With the donated land parcel, the construction of the new station and residential community began to take shape. According to architects Lemay Erickson Willcox Architects, the “21,953 SF fire four-bay station incorporates offices, day spaces, operational support spaces, including HAZMAT response, private bunk-rooms with pass-through lockers for 15 fire fighters, on-site training features, and 20 reserved parking spaces in the below grade parking garage”. The residential community of the Station includes the 64 one-, two-, and three-bedroom units, a community meeting space, underground parking , and a garden terrace that now hosts an organic community garden, with free produce for residents. The Station also features elements designed for livability. Environmentally friendly, the fire station is LEED certified, and the residences are EarthCraft certified, a standard measure in the housing construction industry. Additionally, to mitigate noise from the fire station inside the residences, a concrete layer of padding between the first and second floors, window and frame design, and spring-based ceiling attachments in fire station all work to reduce the noise and vibrations from the station below. “But housing and a fire station on the same site? It is an unusual combination, except in the places where firefighters bunk upstairs when they are not battling blazes. "It's definitely unique," said Greg Toritto, associate publisher of Chicago-based Fire Chief Magazine, which follows firehouse design trends. "We've never heard of residential housing combined with a firehouse." When The Station opened it’s doors, now Mayor-elect, then Del Ray Citizens Association member Justin Wilson said, “It's a win-win situation for the city -- 64 housing units and a new fire station coming at little expense to the taxpayer”. Employing resources from the Low Income Housing Tax Credit program, as well as this City’s Housing Trust Fund, and with the donation of land, The Station was an opportunity well seized, and ushered in a new way of doing housing in Alexandria, and the region. As the area of Potomac Yard grows (with Amazon HQ2 speculation, planned development of housing and office space, and the Potomac Yard Metro Station in the pipeline), affordable housing will always have a place in the neighborhood’s history.